While researching this answer, I learned that there about 5 times per year between late July and September, there are passenger boats from Yakutsk all the way north to Tiksi at 71°39' north. For comparison, the Norwegian North Cape is at 71°10' north and Prudhoe Bay, Alaska is quite far south at 70°20'N, so this passenger boat goes further north than one can drive in either Europe or North America. In fact, to get to Tiksi the boat has to pass along the mouth of the Lena River at 72°25'N before calling at Быковский / Bykovskiye (72°00'N) just north of Tiksi. 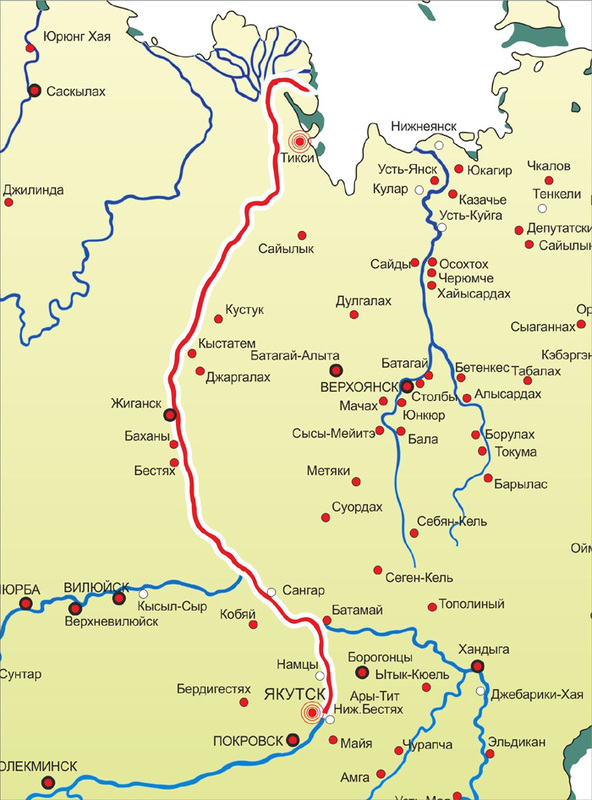 Lenaturflot route Yakutsk–Tiksi. Source: Lenaturflot. What is the furthest north one can get, using only public (winter) roads or regular land-based public transportation? By regular public transportation, I mean public transportation that primarily exists to service communities along the way, as opposed to cruises that exist primarily/exclusively for entertainment purposes. Is Tiksi the northernmost? Assume a starting point in any capital city in mainland Europe or mainland North America (connected by ocean liner, so either continent counts); any point that can be reached without flying from at least one such capital city counts (I think those are all inter-connected by public transport anyway). The Qaanaaq Hotel (hotelqaanaaq.dk) in Greenland, 3971 Qaanaaq Kalaallit Nunaat, is at 77.469, and there is a whole village around it. They website explains: "The travel route is Copenhagen to Kangerlusuaq and to Ilulisat where you have to stay overnight, next morning the flight starts in Ilulisat to Upernavik and to Qaanaaq. There are flights from Ilulisat to Qaanaaq on Wedensday." P.S. I missed 'land-based travel'. So this is probably not valid. Not the answer you're looking for? Browse other questions tagged russia where-on-earth extreme-tourism riverboats arctic or ask your own question. How can I travel to the north pole (Arctic areas) from Russia cheaply? where can one see columns from the world trade center? How can I travel to Russia for the 2018 FIFA World Cup without flying?